We’re not sure what’s going on here, but it sure does look like someone (or perhaps a pair of someones) has dragged a bloody corpse along this pier in order to dump it into this Dutch canal. Does anyone want to have a go at providing an alternative suggestion of what might be going on here? Hey, No Big. Someone is just feeding the fish. Looks like something coming out, not in, judging from the wet trail leading away. Wet footprints of someone who was swimming. That obviously looks like blood.. He is very obviously leaning against a fence as you can see the shadow on the water. 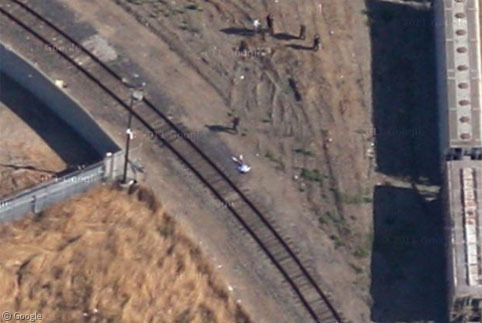 Ive looked at the picture and found it on google earth. Theres a boy across the canal sitting on the bench. Bikers on the trail just a few yards away. If you look even closer you see a third man at the end of the dock or pier squatting in the weeds. All this suggest to me it was not a planned murder. Maybe homeless people attacking joggers? Theres no car in site, the blood pattern starts at the beginning of the pier. Then theres two spots where theres blood splatter where the victim wasnt dead yet so they beat him/her to finish killing him/her. It looks as thou the body is in a sleeping bag. It is a body being dumped. LOL It’s dfefinitely a wet dog!! They are probably playing fetch with it. There are multiple trails because the dog has been back a few times. When you open it in Google Maps one of the two people on the octagonal podium can CLEARLY be seen bending over toward a large black mass which would be about the size and height of a rottweiler or whatever. The “blood” colour is simply wet wood, which you can see has a lovely faded pink hue in the first place. Get it wet and goes a nice shade of red. Many unsealed treated decking timbers are this colour. The big pool of dark red can be easily explained by a four-legged shakeoff once the dog returned to its master. You can trust me, I know a dead body when I see one. Look at the shadows. On the water is the shadow of the person standing at the rail. On the deck beside him is the shadow of the bottom half of a dog. An alternative explanation: it is the shadow of a centaur – that just committed murder. if it was a dog then explain the casket laying open along the path. if you go to the actual map of this scene on google maps and follow path you will see a box thaf appears to look like a casket.